Tennis Server - Circle Game - Is Technology Ruining Tennis? There is a feeling among many tennis experts today that the game is not being played as well as it was in the 60's and 70's. This is not just the grumbling of a few old-timers. Tennis over the past 15-20 years has become more of a shot-making contest than a battle of point development, strategy and finesse. Points are shorter and tennis today seems to be a race to see who can tee off first and end the point quicker. Many observers of the game feel that this has lessened the overall quality of the "product." The drop in television ratings would certainly seem to bear this theory out. This is clearly not what Major Wingfield had in mind when he patented the game in 1874. Tennis was designed to be a contest of skill, technique and, what has also become somewhat of a lost art, sportsmanship. What happened? First, the athletes of today are at a much a higher skill level than they were years ago. Their athleticism has become so great that they are basically able to dominate the game with their shot making abilities. Last summer, I watched Venus Williams up close a few times and I must say that her shot-making ability was tremendous. On several occasions I watched her, pinned five feet behind the baseline with the ball up in her face, PUT THE BALL AWAY. As long as she was relatively well balanced, she could hit a winner from virtually any area of the court. Remember the Todd Martin quote from a while back saying that "the talent level of the players today has superceded their need to learn how to play the game." This is exactly what Martin was talking about. The pros of today can hit winners from virtually any are of the court so why bother taking the time to develop a point? In fact, many of the pros today don't know the first thing about tennis strategy. One of the world's most respected tennis coaches said to me a while back that if "Boris Becker had ever learned how to play the game, no one would have ever beaten him." So yes, the pros of today are much greater athletes than those of yesteryear, but this does not mean that they are better tennis players in the true sense of the word. Would the top players of today beat yesterday's legends? Certainly, but that is not what I'm getting at. Tennis today, even at the recreational levels, has lost much of it's art. Why? Two reasons really. Recreational players and junior players alike yearn to "play like the pros." "Venus and Andre can hit a winner from behind the baseline, why can't I?" By now, you should know how I feel about that line of thinking. However, I don't feel that this mentality is solely to blame for the decline in skill that we see today. I think a lot of it has to do with the improvements(?) in racket technology over the past 30 years. First there was simply wood--remember the Jack Kramer autographed frame? Of course you do, we all had one. Then in the 70's came steel (Jimmy Connors' Wilson T-2000), followed by aluminum, graphite (the Arthur Ashe rug-beater), boron and then the big breakthrough---titanium. Along with these revolutionary material changes came other technological advances. Before 1970 rackets all were made with pretty much the same head size. Then there was mid-sized heads, mid plus sized heads, wider heads, oversized heads and now there are super-oversized heads. Have you ever seen the "Weed" racket? It's virtually the size of a service box. All of these improvements, and I say improvements with a great deal of hesitation, were made to make the game easier to play. To require less skill. Many of today's rackets are advertised as having "more power, greater reach with bigger sweet spots" that are "great on off-center hits." Super, now players who have skill deficiencies don't need to work to improve them, they just need to keep searching for a racket that will allow them to get away with them. I hear more players today bragging about their new racket than their new backhand. Players that learned with wooden rackets were forced to develop proficient technical skills. The heads of the racket were smaller, so they had to develop movement, balance and visual skills in order to get into position to hit the ball on the smaller "sweet spot." In addition, wooden rackets provided very little power, so the players of yesterday had to learn to use their bodies to generate pace. Step into the ball, rotate the hips and shoulders, this is what you had to do to put anything on the ball. As a result of the equipment, the player was forced to develop these techniques or else they would not be able to consistently strike the ball cleanly. With the shifts in technology, the emphasis has moved away from skill development and more towards what the racket could do for the player. The rackets of the past few years have become so powerful that the player's overall approach to the game has changed. In the past, players were forced to develop points and maneuver their opponents to open up the court. Today, the players main focus is getting set to "tee off" and hit a winner. Power has truly replaced placement as the main theme of tennis, and this is wrong! Are there benefits to the high-tech rackets of today? Of course there are, but not before, or as a replacement to, the player developing their skills. Many players today have rackets in their hands that provide things that they are not yet equipped to handle. It's much like handing your 16 year-old child a Ferrari before they have learned to drive around the block. A friend of mine is a ski instructor and he told me that a similar thing happened in his sport a few years ago. The big "thing" in ski technology was to make skis that would allow people to go faster (the tennis equivalent of hitting harder). Everyone wanted to go faster so the ski companies developed products that would enable people to fly down the hill. Now the fact that many of these skiers did not possess the skills necessary to control these ski's was seemingly irrelevant. The result was a tremendous increase in skiing accidents and serious injuries as a result of, you guessed it, people going too fast on their high-tech skis and not having the skills to handle the speed. While you're not likely to see many serious injuries as a result of the new high-tech rackets, take a look around and notice the number of people with tennis elbow these day. Is this caused by the new high-tech rackets? I don't know, but with the old rackets we all had to learn to use our bodies to hit the ball with any force. Our bodies absorbed quite a bit of the shock that occurs at impact. With the new "power rackets" we don't need to use our bodies to gain power so we simply swing our arm and thus, it is our arm which absorbs the majority of the impact. Could there be a connection? In his great book "Coaching Tennis" Chuck Kriese talked about the change in tennis by saying that, "Many felt that the entire game of tennis was being changed before their very eyes. Points became much shorter and less interesting to watch, and, to my way of thinking as a teacher and a coach, the game lost much of it's art. 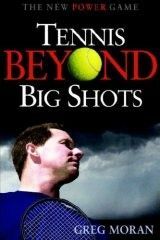 Point development and strategies became less important than hard hitting and great shot making." Kriese, Head Coach at the University of Clemson, ended by saying that "the use of higher-tech rackets has made skill less important than the equipment itself; therefore, the sport is made somewhat less fun and interesting. The great drop off in players in the mid 1990's was most likely a result of this." Tennis players always try to emulate the pros of their era. Remember when the two-handed backhand became the "fashionable" thing to learn? Connors, Evert and Borg were the top players in the world. 30 years ago, the way the pros played the game was something that recreational players SHOULD have attempted to emulate. The pros of yesteryear ALL had good technique, command of all the shots and played a game of control, consistency and finesse. With the tremendous evolution of the modern athlete and the advances in technology, the game that I learned as a child is completely different, and the gap between the way the pros play and the way we should play is wider than ever. For non-elite athletes like us to approach the game the way Venus, Pete and Andre do is a short path to frustration. John McEnroe has many times suggested a return to wooden rackets, in an attempt to restore some of tennis' lost artistry. In fact, there are tournaments popping up all over the world that are billed as "wooden racket events." I've watched a few of these and believe me, the tennis is always entertaining. In other words, there are no high-tech short cuts to becoming a good tennis player and no racket is a substitute for solid skills.